Chlorine agents and acids are common swimming pool chemicals for controlling water quality. Unfortunately, these chemicals are incompatible. Catastrophic consequences can occur if not properly stored and handled. How Do Swimming Pool Chemicals Work? Chlorine agents release chlorine into pools when mixed with water. Chlorine agents are oxidizers and release oxygen during reactions with other chemicals. This creates an explosive environment and can accelerate a fire. Chemicals for pools react when mixed with a large quantity of water. A small volume of water falling onto the pool chemical while in storage can also cause a reaction. Highly corrosive substances can result as well as the release of toxic chemicals like chlorine gas. Unintentional mixing of pool chemicals may lead to unexpected chemical reactions and fire risk. There is the added danger of a release of toxic materials. Store incompatible materials separately to minimize these risks. Do not store flammable liquids like gasoline or diesel with pool chemicals. Keep dirty or oily rags out of the pool chemical storage area. Always consult the Safety Data Sheet (SDS) information for each swimming pool chemical to develop safe handling and storage procedures. Always use dedicated tools when handling chemicals for pools. Accidents may occur when the same dispensing tool is used for one chemical and then another. This precaution also applies to equipment used to clean up spills. Never sweep up spilled chemicals into a single container. Apply a large volume of water when fighting a fire involving pool chemicals. This will lower the temperature and reduce the release of toxic gases. Wear personal protective equipment (PPE) when handling swimming pool chemicals. Chlorine reacts with moisture in the human body to cause discomfort and injury. Bodily moisture such as sweat reacts with chlorine gas to form an acid that burns body tissues. Safety goggles, protective gloves and face shields are standard PPE for working with pool chemicals. Use a respirator in cases where dust or vapors are present. 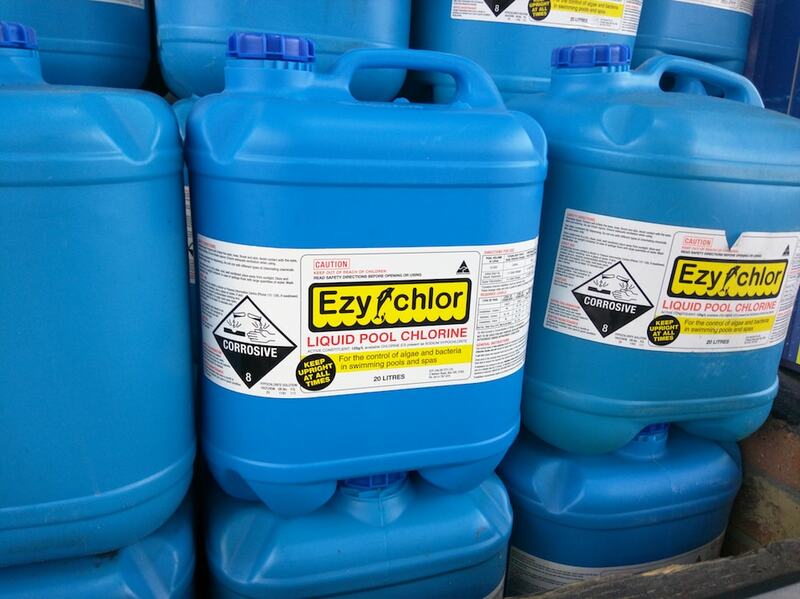 Store chemicals for pools in a cool, dry location that’s well-ventilated to prevent the buildup of hazardous gases. To prevent unauthorized access, always keep pool chemicals in a locked chemical storage building. Make sure no water drips onto exposed chemicals or packaging. Check for potential sources of water, like a leaking roof of the storage container or leaking fire protection systems. In addition, avoid storing liquid chemicals above dry chemicals. Liquid that spills onto the dry chemicals may lead to a chemical reaction. Keep chemicals for pools in their original containers – transferring to different storage containers may prove dangerous. Properly seal swimming pool chemicals after each use. U.S. Chemical Storage provides pool chemical storage buildings that meet regulatory requirements and keep chemicals safe. Leak proof secondary containment prevents a spill from mixing with other swimming pool chemicals. Climate controlled buildings prevent excessive temperatures from affecting the contents. Passive ventilation or the use of an exhaust fan are also available. Contact U.S. Chemical Storage to learn more about pool chemical storage or to receive a complimentary quote. Our professional consultants can advise you on the best solution for your application as well as the regulatory requirements that are relevant to your industry. Chemical Storage Buildings: What Style Fits Your Needs?